Your bag might be the last thing on your mind when you’re enjoying a great meal or cocktail, but an unwatched bag is a thief’s dream. These tips will help protect your belongings. If you’re a woman, thieves are more likely to target you than a man. No, it’s not because crooks think women are weaker or more vulnerable—it’s because women carry so much in their bags. “A purse contains a treasure trove of valuables,” says Detective Sgt. Kevin Coffey, retired detective of the Los Angeles Police Department and founder of Corporate Travel Safety who specializes in travel crime presentations. Think about it: Your purse probably contains your wallet and all of its credit cards and cash, your phone, your keys, and more. If someone were to lift your bag, they’d have access to a lot of personal information and expensive objects beyond what they’d find in a man’s back pocket. At restaurants, the most common spot for women to leave their bags is on the back of their chairs, Coffey says. But keeping it behind you leaves it vulnerable to being swiped by anyone walking by. Rest your bag on the floor, and a thief could casually pick it up or kick it away while your eyes are turned. If you’re standing by the bar, don’t let your purse fall behind your back. “You can’t feel a purse being pickpocketed. It doesn’t have feelings on it,” Coffey says. A male friend might feel a pickpocket’s hand sneaking in his pocket, but your purse is a wide-open target. 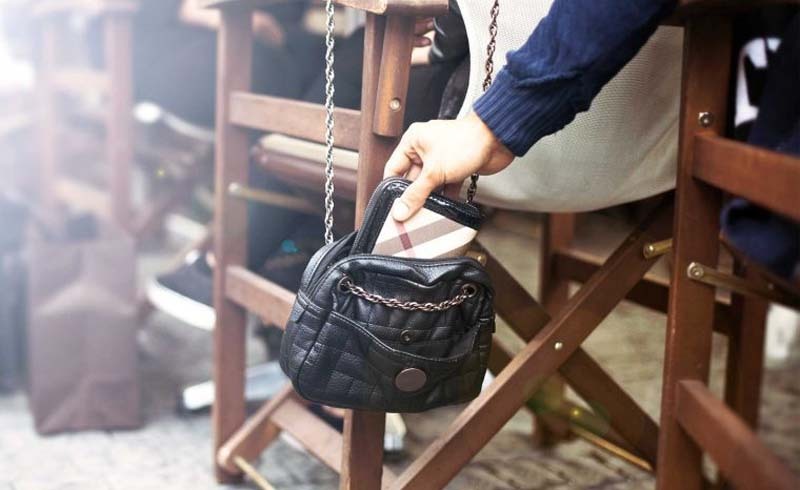 The safest spot for your handbag is on your lap or under your thigh (if it’s small enough), but realistically you probably won’t want to cling to it for your whole meal, and your leg might start to get uncomfortable. Instead, lift up one leg of your chair and loop the purse strap around it, so when you lower the seat down it’s secure. “You would have to get out of the chair for someone to get it,” Coffey says. “It’s very easy, but few people do it.” Swing your bag in front of you so you can keep an eye on it for extra security, he says. Your best bet is a purse that’s zipped shut—especially if it has a buckled flap over that zipper, which requires two steps to get inside. Some purses even have or clips to hold the zipper shut or detachable shoulder straps to loop around your chair back. A shorter strap is ideal too. “A longer strap is easier to get behind you, and you’re least detached to a longer purse and won’t feel it getting picked as much,” Coffey says. Once you have the right bag, pack it wisely. Leave any credit cards you don’t plan to use at home. Then, bury your wallet at the bottom of your purse or at least lay something else on top of it. “That way it’s not the first thing a thief sees when they open your purse,” Coffey says.